Rising just a short distance from Singapore’s premier shopping haven, Orchard Road, is a revolutionary residential address unlike any other. Thoughtfully designed as a vertical city, Scotts Tower will change the urban landscape by 2020. It’s an upmarket 103-leasehold by Far East Development and Whitewater Properties, offering a supremely luxurious city lifestyle. Scotts Tower is located at 38 Scotts Road, just within the neighborhood of Orchard Road. Along with this address comes the privileges as well as the prestige of high-class cosmopolitan living. Nearby are world-class destinations for recreation, entertainment, shopping and so much more. The 31-storey development follows a unique master-plan echoing a progressive, modern township, but stretching upward, layer upon layer. It has three main components, namely City, Neighborhood, and Home. Interspersed among these are exciting recreational amenities and refreshing garden features. Scotts Tower’s cutting-edge design is the brain-child of Ben van Berkel, founder of the illustrious UNStudio. This acclaimed Amsterdam firm is the designer of several of the most inventive architectural works the world has seen in recent history, including Rotterdam’s Erasmus Bridge, Stuttgart’s Mercedes-Benz Museum, and Chicago’s Burnham Pavillions. The living spaces are grouped into four sections, each representing a residential neighborhood. 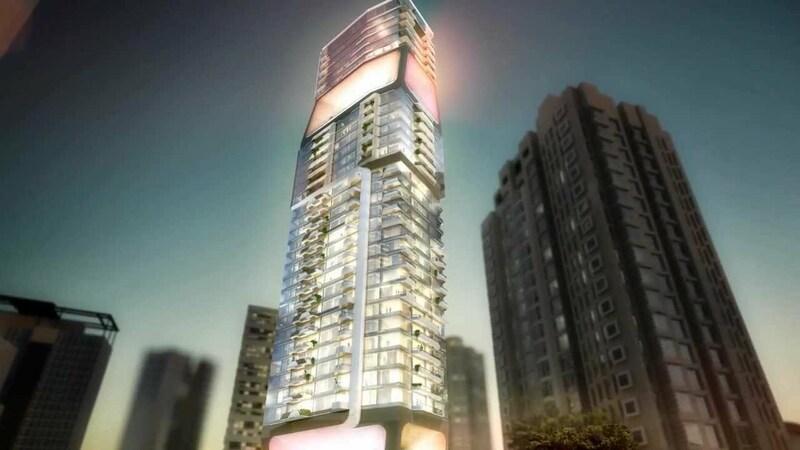 There will be a total of 231 SOHO units that look out into a spectacular view of the city. All units will be given an impeccably finished interior by Creative Mind Design. Each home will be given an atmosphere of everyday opulence, via imported marble flooring and other high-quality materials. The designer kitchens will also be fleshed out with appliances by Gaggenau. Living in the city doesn’t have to mean being surrounded by cold concrete and glass. Among Scotts Tower’s most significant features are the gardens and the sunny spaces. It has some green-fringed areas that cheer the soul, landscaped by Sitetectonix Pte Ltd. The residential units also have private terraces incorporated into their design, providing occupants with nice, comfortable areas for some sunshine and fresh air. The penthouses even come with private rooftop gardens. The tower has three levels of treats for your body and soul, including an impressive Sky Lobby and a Sky Terrace. There are a lot of things to see, do and enjoy, all within a single building. A short distance from your new home is Orchard Road, which puts forth a scintillating array of shopping malls, restaurants, hotels and others. Find your favorites at ION Orchard, Forum the Shopping Mall, Plaza Singapura, or The Centrepoint. You won’t run out of things to do. There are also a few clubs nearby, such as The American Club and Tanglin Club. There are a lot of schools within the vicinity, which is great news for families. Some of the known institutions are Raffles Girls School , Anglo-Chinese School and several pre-schools. There are also some international schools like Chatsworth International school. Apart from these, there are institutions offering a college-level education, like Aventos School of Management and Lasalle College of the Arts. The ease of travel in this area is superlative. Residents at the Scotts Tower can catch a ride at the Orchard MRT Station or the Newton MRT Station. For those who prefer to drive their own vehicles, they can take Bukit Timah Road, Central Expressway, or the Pan-Island Expressway. A vertical city at a single site, Scotts Tower is destined to be a new landmark development in District 9’s Orchard area. With its stunning architecture and innovative planning, it will be the talk of the town. It’s the kind of address any discerning home-buyer would love to live in. Whether you’re interested in buying your own residence, or investing in a property to rent, Scotts Tower is a sure win. Set a meeting with iCompareLoan mortgage broker so you can compare mortgage loan Singapore and plan your future. Come home to a restful haven amidst the beauty of nature, where everything is fresh and breezy. Alias Villas is a limited collection of tropical homes surrounded by a green landscape and lush spaces, not far from the city. All at once inspiring, energizing, and lavish, this cluster development is a modern take on the humble Malay village. This lovely little enclave is the brainchild of WHA Heritage, by Warees Investments Pte. Ltd. It’s situated in a tranquil spot along Jalan Haji Alias, in a pleasant residential neighborhood in District 10. The development features a handful of villas, reflecting traditional elements combined with modern ingenuity. The genius behind this concept is Aamer Taher, founder of Aamer Architects, who is known for his dynamic, flowing designs that are much like works of art. Only six landed units occupy the property, each one a semi-detached terraced house unlike others you’ve seen before. This community is an expression of both culture and creativity, of both the past and the future. At first glance, it looks like a grouping of quaint country cottages, much like the kampong. However, upon closer inspection, you’ll see that it’s an assemblage of highly sophisticated, contemporary living spaces befitting even the most discriminating of home-buyers. Airy-looking structures with signature sloping roofs are elegantly arranged around a leisure pool and a landscaped lawn. Alias Villas epitomizes the elevated family lifestyle: four spaciously planned, artfully imagined levels. There are four bedrooms, plus a grandiose Master suite and a maid’s room. There is a well-lit study area, an entertainment room, balconies, an open-roof terrace, a two-car garage, and a utility area. It even comes with a private lift for easier access to all levels. Full length windows maximize the light and space, making the home even more radiant within. Certain units come with a porch deck and a hot tub, while others have a porch with a private garden; some also have an enclosed back yard. Gleaming marble floors in Volakas or Crema Marfil enfold you in subtle splendor. Timber strip wall panels and Burmese teak bedroom floors add a cordial, idyllic flair. The kitchen is arrayed in Bosch appliances, such as a stove, cooker hob, and an oven. As an added bonus, home buyers may pick a color palette, choosing between warm tones and cool hues. True to its charming village motif, Alias Villas fosters a nurturing environment, safe for families with growing children. It’s an ideal situation to forge stronger relationships and create lasting memories with your loved ones. The refreshing waves of the pool bid you to come and cool down, as the florid garden setting soothes your soul. Whether you enjoy an active lifestyle or a more relaxed one, you’ll find your sanctuary in this modern hamlet. It’s a most desirable, provincial retreat near the metropolis. Indeed, the rewards of the city aren’t far away. Less than a kilometer from the site is the new Sixth Avenue Station (Downtown Line). Also close by are the MRT Stations of Farrer Road, Botanic Gardens, and Holland Village, which are all on the Circle Line. From Holland Village, the Buona Vista Interchange is one stop away, letting you switch to the East-West Line so easily. If you prefer driving, you can coast down Bukit Timah Road, Dunearn Road, Holland Road, Farrer Road, the BKE, or the PIE. The famous shopping destination of Orchard Road is just a 15-minute trip away by car. There, you’ll find a most satisfying assembly of the best shopping malls, hotels, restaurants, clubs and more. Also just minutes away are Holland Village, Coronation Plaza, an the Grand Stand. Whenever you need to stock up on your daily needs, you can stop by the NTUC Fairprice in Coronation Shopping Plaza, or the Giant Hypermart in the Grand Stand. If you’re a Cold Storage fan, there’s a branch along Greenwood Avenue, and another one in Bukit Timah branch. There’s also a nice German Market Place near by. There are also several schools for your children within the general area. You can consider enrolling your young ones at Hwa Chong Institution, Hwa Chong International School, Henry Park Primary School, Chinese High School, or National Junior College. If you’ve got daughters and you want them to benefit from an all-girls institution, you can opt for Methodist Girls’ School, Nanyang Girls High School, or Nanyang Girls Boarding School. Your older kids can think about taking college at Nanyang Polytechnic, Ngee Ann Polytechnic, or Singapore Institute of Management. For your recreational activities, there are a lot of parks and gardens to choose from. Among them are Singapore Botanic Gardens, Bukit Timah Nature Reserve, Mac Ritchie Reservoir Park, and the Central Water Catchment Nature Reserve. You can plan hours of active fun for the whole family, or even just a laid-back rest day. You can also look into the activities offered by the nearby sports clubs and facilities, like Singapore Island Country Club, Champions Public Golf Course, Bukit Timah Saddle Club, and The Rainforest Sports Hub. Not many residential developments are able to successfully combine modern living with nature and cultural heritage, all together with serenity as well as accessibility. This is what makes Alias Villas supremely special. There’s really nothing quite like it, thus its immeasurable appeal. If you would like to take part in the exclusive, elite lifestyle offered by Alias Villas, get in touch with iCompareLoan mortgage broker. They’ll help you compare home loan Singapore and give you some handy tips as you plan your finances.